George Lucas was the guy who invented the concept of the Force, and then 30 years later decided that the Force was actually produced by midi-chlorians, a type of microorganism in the blood of a person. After that, he apparently realized that he just doesn�t get these new kids, which is the reason why his last three films in the Star Wars franchise failed so miserably, even when it comes to selling a lot of merchandise (for some reason, not many people bought Hayden Christensen T-shirts). At that moment, he did something unattainable for most despots through history and released the reins to someone else for the Star Wars: The Force Awakens. Lucas was done and many felt really happy that he was out of the picture. The guy who filled his shoes was J.J. Abrams, a film industry veteran that must have been Cardinal Richelieu or someone like him in his past life because he continues to swim like a champion in the shark-infested waters of Hollywood. Now, the same person revitalized both Star Trek and Star Wars, which is for me a very fitting end to the age of the 1980�s when both franchises found their audience. Back then, these two had hardly anything in common, except the word Star in their title and the appearance of star ships in their plots. But now, thanks to the Abrams� brilliant but also somehow hellish brewing pot, these two are practically identical space opera stories set in a sci-fi type of setting. I wouldn�t be surprised if he even decided to do a crossover movie where some of the characters from the new Star Wars films end up on the Enterprise. Is this something that is desirable? Well, no, but strictly from a cinematographic point of view. Abrams is a man devoid of any vision apart from being a craftsman who specializes in refurbishing stuff. A man like him picks up broken things from the past, paints them in a currently very popular color and sells them for a profit. But, this does not make the new Star Wars film an unpleasant viewing experience. In the adventure story that looks like a retelling of the first film (or the 4th one according to the new calendar), there is plenty of fun and excitement. I didn�t have a problem with plot similarities, while the stars from the original trilogy strangely absent in the films from the early 2000�s now return, looking old, frail and disconnected, especially Harrison Ford, but they were brought in not to do or say anything especially important, but just to be there visually. They are a human equivalent of a light saber and have a similar purpose of popping up at the appropriate moment. I�m pretty sure that when CGI becomes a bit more advanced, the same people will only appear as computer simulations. 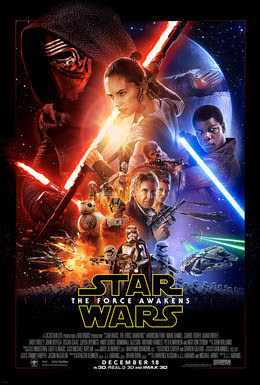 Everything else is adequate in the Star Wars: The Force Awakens. New actors are fine, but none of them are Ford in 1977 even by a long shot. The locations are exciting and the action unravels just like Abrams� notebook of action films says it should. All in this film is average and above average, finely crafted and marketed perfectly like a high-quality action figure selection they are planning to sell across the world. Like an action figure, this film is designed to be consumed and forgotten, while details from it will remain forever in the new apps, games, toys and T-Shirts. Because of this, the visual design of the mask that Kylo Ren wears will outlive the plot of the film or any of its cinematic moments, big or small. Here, the brilliance of Abrams� ability to constantly upgrade the idea of the smart-looking blockbuster is seen in full force. But, for some reason, he forgot all about midi-chlorians which are never even hinted at in this film. I wonder if Lukas is disappointed about that, but at the same time, I also believe that no one bothered to ask him.